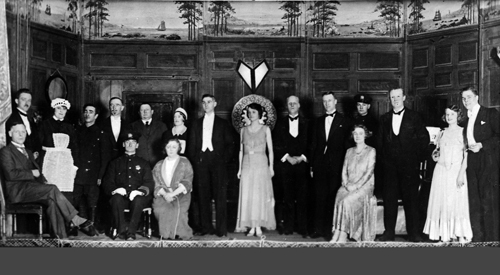 9-45 was the production for February 20th and 21st at the Town Hall in 1931. Whilst there were clearly areas of overlap in their dramatic and musical interests, the were different groups operating in Cromer and Sheringham at various times to put on productions. At one time Cromer had its own Operatic and Dramatic Society, staging its productions at the Town Hall. It's interesting to note that there was clearly co-operation in many ways - at least one set for the Cromer and Sheringham Players is clearly the same as that for the Cromer Amateur and Dramatic Society. As we have said on a number of other pages, if you can help with names for any of these pcitures, then please let us know by using the 'Feedback' page.